I want to create two VM on two separate hosts (one per host) that reside on the same network. I also want the VMs to reside in a different network than the host's network. To do this with openvswitch is really easy. 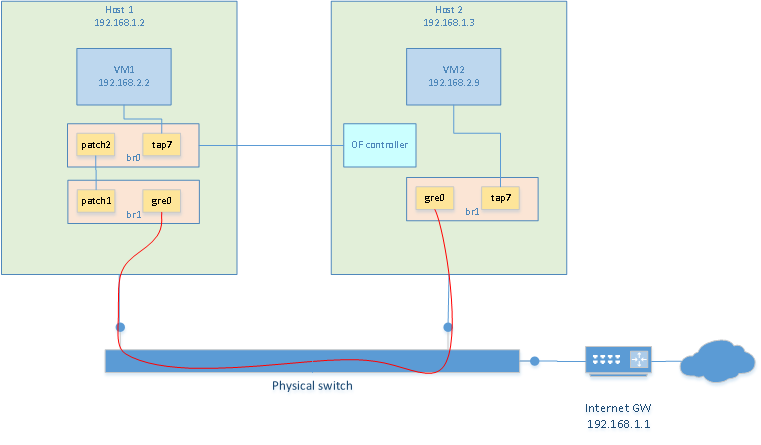 Openvswitch is already part of the kernel. It needs to be enabled when compiling the kernel. Then the tools need to be installed. On slackware, it was just a matter of ./configure, make, make install. Now, it is possible to start a VM on each host using their respective TAP7 interface. Each vm is assigned an IP address in the same subnet but different than the one of the hosts. In my case I used 192.168.2.2 and 192.168.2.9. Because a GRE interface is present in the bridges, both VM can communicate with each other now. port of type "patch" can be used to "connect a patch cable" between 2 vswitches. This would be used to connect two vswitches together as long as they reside on the same host. To connect two vswitches that reside on different hosts, a port of type GRE would be needed. In the example above, the ovsdb-server was started with --remote=ptcp:6640. This means that it is possible to control the vswitch from any other host using "ovs-vsctl --db=tcp:192.168.1.2:6640 ". This is great when a virtual switch spans across several host because all host bridges can be controlled from one single point. The best description of OpenFlow and SDN I found was this: OpenFlow is a protocol which lets you offload the control plane of all the switches to a central controller and lets a central software define the behavior of the network (also called Software Defined Networks). To me, that description was the one that opened the doors to SDN in a time where all of those terminologies was confusing to me. Before going any further, let's first define what a flow is. An open flow switch makes forwarding/routing decisions based on its flow tables. Each flow represent a "rule" that must be matched and the action that must be taken if the rule does match. Flows are added by a separate piece of software to the switch. The switch does not "build" its own flows. These must be explicitely added to the switch by the switch administrator when first configuring the switch or dynamically by an SDN controller. If using an SDN controller, when a frame/packet/segment does not match any flows, it will be sent to the SDN controller in order to find a flow that matches. The flows contain a "match" part. It defines fields of frame/packet/segment must be matched so that the flow applies. If the flow does apply, then the "action" part is used. Matches can be specify that a flow must match a source MAC address, a destination TCP port, or any other L2/3/4 fields. Combinations of fields can be matched and wildcards can be used. The flows also contain an "action" part. Actions are very flexible. I won't detail all the possible actions here. An action could be to drop the packet, forward the frame, redirect to another flow table (internal to the switch) etc. ovs-ofctl add-flow br0 "table=0, tcp,tp_dst=80, actions=drop"
This one would rewrite any segment going towards TCP port 80 to go to tcp port 25. This is basically port forwarding. Note that two flows need to be written. Once the server on port 25 sends a reply, it needs to be modified to use port 80 since the client is expecting to be communicating on port 80.
ovs-ofctl add-flow br0 "table=0, tcp,tp_dst=80,nw_dst=192.168.2.2, actions=mod_tp_dst:25,normal" ovs-ofctl add-flow br0 "table=0, tcp,tp_src=25,nw_src=192.168.2.2, actions=mod_tp_src:80,normal"
This will add flows to the bridge on the local host. This could be done when configuring the switch initially. Obviously, more complex (and more useful) flows could be written, but this is just to get a hang of it. It could also be useful to have the switch's flow tables be populated dynamically by some other "brain". Such a brain would be an "opendlow controller". The controller can reside on a separate host. Using "forwarding.l2_learning" with pox creates a very basic flow that makes the switch act like a normal layer2 switch. You could write other modules for pox, but that is beyond the scope of this example. At least, now you know how to have a remote controller generate the flows dynamically. You could download another software to do it or even write your own. By the way, using an openflow controller, we could drop the iptables usage from the above section and implement NAT using openflow only.